Tendonitis of the Shoulder is another way of saying it, but that's not very accurate. A more accurate question is..."What is Rotator Cuff Tendonitis?" "Having Inflammation and wear and tear injury (tendonitis) on one or more of the tendons of the muscles that make up the 'rotator cuff'." This can be caused by repetitive strain injury, but you can have inflammation and pain without any repetitive strain or wear and tear. You can have tendonitis with shoulder injury, or without. Most definitions you will find on the internet describe Rotator Cuff Tendonitis as tendonitis of a specific tendon. The Rotator Cuff is made up of several muscles and tendons that stabilize and mobilize the shoulder/arm. One or all of those tendons can get tendonitis. And the muscle and connective tissue is just a much a player in shoulder injury as the tendon is. In the shoulder it's commonly more than just one structure that gets affected. One tendon might have it worse, but it's never isolated to just one tendon. Call it what you want, Shoulder Injury, Repetitive Strain Injury, Rotator Cuff Tendonitis or Rotator Cuff Injury, if there's no significant rip or tear, then you're looking at the usual handful of factors that all go together to create the Tendonitis dynamic. When you know how Tendonitis in general works, you'll have a far greater understanding of your Shoulder Tendonitis. There are many causes of Shoulder Joint Pain, and tendonitis of the shoulder dynamic helps cause several of them (including osteoarthritis). There are several muscles that work with the shoulder ligaments to hold the arm securely in the socket, as well as to allow movement. The muscles provide movement and stability, and tendons attach muscle to bone. The ligaments provide static (non-mobile) support and stability to the shoulder joint. 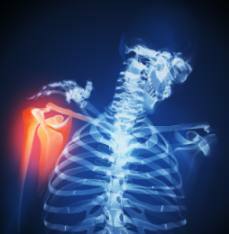 Shoulder Tendonitis can be a source of chronic shoulder pain. You also could have shoulder problems from a Pulled Chest Muscle (which is really a tendon injury, potentially the tendon that attaches to the shoulder, one of the shoulder cuff muscles and tendons). Like all Tendonitis, if you have shoulder pain from shoulder tendinitis, Rest will help temporarily, but if you start using your shoulder again in the ways that caused you to get rotator cuff tendonitis in the first place, the pain will return. Shoulder Tendinitis pain can be in an isolated hot spot that hurts when you are using your arm and shoulder to perform some activity. If it is chronic and/or severe tendonitis, you can experience neck and shoulder pain, as all the surrounding muscles start compensating for the injury. Either way, it won't show up on an X-ray. If you have rotator cuff pain that is from -only- from Tendonitis, then it is unlikely that rotator cuff surgery will be of benefit to you in the long run. Dealing with the wear and tear tendon injury and the Process of Inflammation that comes with it is the best option in that case. If one of your rotator cuff muscles has torn tendon, depending on the damage, then rotator cuff surgery might be a good idea. Consult your Doctor. You can have pain in your left shoulder, pain in your right shoulder, or both. It depends on what activities you are performing that caused the Shoulder Tendonitis and its Pain Causing Dynamic. If the ecology of the shoulder tendonitis gets bad enough, this can set you up for Calcific Tendonitis. Shoulder injuries can be confusing to tell apart. Depending on the source of the damage, the type of damage, your physical health, damage can show up in different ways. Realistically, all tendonitis in shoulder tendons is due to chronic shoulder tendonitis. All tendonitis is chronic until you fix it. Whether it's a result of sports injury-related tendonitis shoulder pains, or from new moms carrying their new baby around (heavy! ), chronic shoulder tendonitis results. It starts with a little tightness, then more tightness and inflammation, then more tightness and inflammation and pain....and it's all downhill from there. *Note: All of the below can both result from chronic shoulder tendonitis, AND cause/make it worse. Collar Bone Pain Collar Bone Pain can be a result of the shoulder tendinitis dynamic (not often) or it can be a factor that helps cause it. A Shoulder Dislocation A dislocation happens when the ball joint leaves the socket. This stretches the ligaments of the shoulder joint. This stretching can be permanent. A Shoulder Separation A 'Shoulder Separation' actually involves the Acromio-Clavicular joint (the AC joint), and has nothing to do with the shoulder's ball joint. A Shoulder Subluxation This is a partial dislocation, coming out of joint 'a little bit' as opposed to all the way. In my book, anything more than 'a little bit' can be a big problem as it stretches the ligaments that hold the joint in place. Shoulder Tendinitis is often mistakenly called Shoulder Bursitis. It is not. Bursitis is inflammation of the bursa, which is a kind of padding/friction reducer. A Shoulder Impingement. A Shoulder Impingement can eventually show up as a side effect of certain Rotator Cuff Tendonitis cases, or it can show up with out any Tendonitis involvement. A SLAP tear occurs at the point where the tendon of the biceps muscle inserts on the labrum (the socket where the arm bone meets the shoulder bones). A SLAP tear is a specific type of labral tear this stands for Superior Labrum from Anterior to Posterior. A Frozen Shoulder True Frozen Shoulder is rare. *Note: All of the above can both result from chronic shoulder tendinitis, AND cause/make it worse. *NOTE: Rotator Cuff Tendonitis is another name for tendonitis of the shoulder. If you have Shoulder Tendinitis, good news. With the RIGHT information, it can be dealt with. Do know that Rotator Cuff Tendonitis is the hardest Tendonitis to fix yourself, as it's a bit tough to get to. Stick with me. We'll get you there. Stick with me, and I'll tell you that one of the first things that you MUST do to lower the pain levels of shoulder tendonitis is to learn How To Reduce Inflammation. It's very possible to have a Bone Spur also develop from all the compression, tension, and other factors. And of course, for a prognosis of 'my shoulder tendonitis is gone', I highly suggest the Reversing Shoulder Tendonitis ebook. "If you have tendonitis, buying one of Josh’s e-books to cure it is probably some of the best money you could ever spend. My body was so locked up with tendonitis, I almost couldn’t move and was in agonizing pain. Josh cured me. I am a Cat 3 cyclist riding 150 miles per week. Additionally, I lift weights 3 times per week, play tennis 3 times per week, and usually hike in the mountains twice per month. I have been a vegetarian off and on over many years and have been an athlete my entire adult life. I am 60 years old. Several months ago, I began experiencing some pain and tightness in my arms and the back of my legs. Within a period of 2 weeks, I had developed a massive case of iliopsoas tendonitis-syndrome and shoulder tendonitis. The pain was excruciating and I was barely able to move. I couldn’t understand what was happening. My sports doctor was useless, suggesting that maybe I had been doing too much lately and should rest. Rest did nothing. Each morning I would get out of bed and start the day again with the same agonizing pain. It never got better. It was the most severe in my arms and shoulders. I couldn’t lift my arms higher than my waist and the muscles in my arms essentially stopped firing. My biceps went completely flat. The exercises for tendonitis I would find across the internet were useless. After a few more weeks, I got lucky one day and found The Tendonitis Expert website while trying to Google a cure for tendonitis. 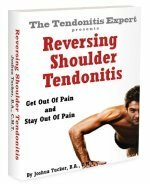 I purchased the Reversing Shoulder Tendonitis e-book, and would later purchase an e-book to support reversing the iliopsoas tendonitis from Josh’s counterpart, Barton Anderson at Sports Injury Info. That tendonitis has also been cured. I incorporated all of the exercise recommendations in Josh’s e-book, along with the icing techniques and nutritional changes. While my Vitamin D levels would turn out to be normal, the lack of protein in my diet and low magnesium levels appear to have caused a full muscular crash across my body. After 8 days of using Josh’s therapy, I began seeing some small results. Each week, I got a little better. I did all that was described in the e-book 7 days per week for 90 days. At this point, I was starting to feel like some version of normal again, though there was still some remaining weakness and stiffness in my arms. From this time forward, my recovery became very rapid. At 120 days, my arms and shoulders are back about 98% and most of the strength has returned to my upper body. Josh has given me my life back." Return to the top of this Shoulder Tendonitis Page.